GDP Growth in the First Quarter – First Quarter Curse? The Bureau of Economic Analysis (BEA) revised real GDP growth down to a seasonally adjusted annual rate of -0.7% in the first quarter of 2015 from an initial estimate of +0.2%. The main factors were an upward revision to imports (which subtract from GDP growth) and a downward revision to inventory investment. 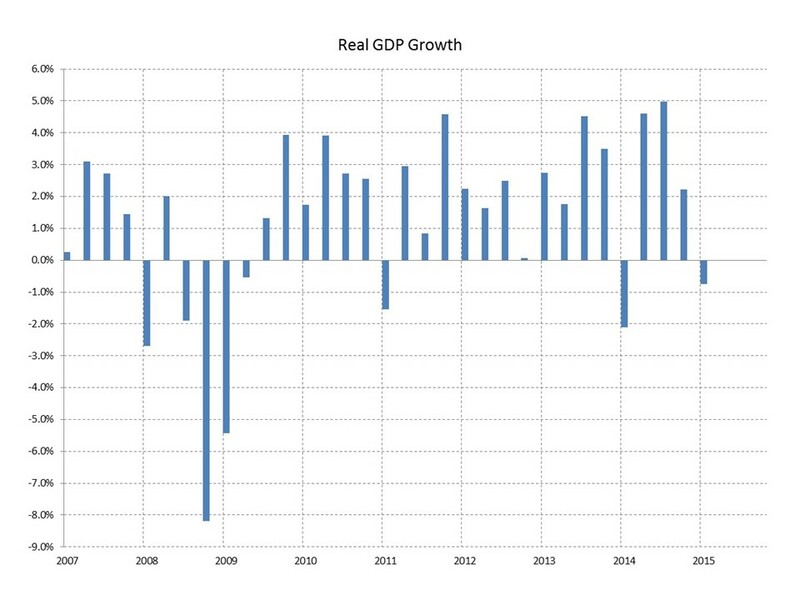 Real GDP grew at an annual rate of 2.2% in the fourth quarter of 2014. The slowdown in first quarter economic growth was expected but the extent of the slowdown was a surprise (GDP). In these revisions less inventory investment in the first quarter means less drag from decelerating investment in coming quarters, but the level of inventory investment is elevated so deceleration and drag there will be. The depressing effect on exports and the boost to imports from a strong dollar are heightened in these revisions and unlikely to reverse in the near term given weakness in the Eurozone, slowing in previously strong economies (e.g., China), and anxiety related to Greek debt negotiations. The near term outlook is not improved by today’s release. There has been some discussion of residual seasonality in the first quarter growth figures in recent years, underestimating growth due to less than successful adjustments to control for predictable weather patterns. One study by economists at the Federal Reserve Board finds a lack of evidence for such an explanation of the recent first quarter stalls (FRB). If so, it’s not the data, it’s the economy.